Our November magazine is out now. How can we seek peace? We reflect on an evening of music, poetry and history to mark the centenary of the WW1 Armistice. 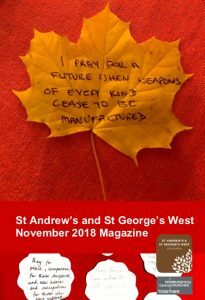 Nick Evans considers John Bell’s lecture; Mary Davidson brings news of the autumn Christian Aid Art Sale and Pat McKerrow shares her encounter with a kingfisher. Plus: the latest reviews from Cornerstone Books and a prayer-poem for Thanksgiving as Allison Becker explores her journey from California to Kilmarnock.